When buying a vehicle with more than a quarter of a million miles, you have to expect it’s going to need a lot of work right out of the gate. 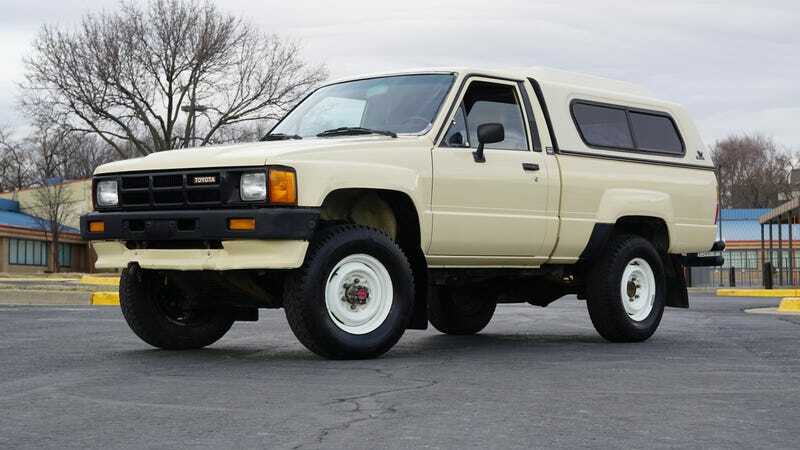 When I decided to purchase this 1986 Toyota Pickup Turbo, I may have underestimated how much work that would be. When I first wrote about this purchase, I gave you all a heads-up that it was leaking oil. Well, it wasn’t just leaking oil—it was puking it out. I couldn’t drive it the way it was, I had to fix it immediately. Compounding on the oil hemorrhage, there was also a terrible rattling noise coming from the front of the engine. That’s five minutes after shut down. Anyone who is familiar with the ’80s era of four-cylinder Toyota engines knows that their timing chain systems are a weak point. More specifically, the timing chain guides, which are made from plastic, are known to become brittle and crack. Once this happens, they no longer “guide” the chain. The timing chain begins to slap around inside the timing cover, making a huge racket. If it’s allowed to continue, the chain can cause severe damage to the engine. I had to assume that my little Toyota had fallen victim to the timing chain issue, which made the oil leak seem like a petty ailment in comparison. Upon poking around under the truck, I determined that the oil leak was originating from the front of the engine. The timing chain system was also at the front of the engine. This meant that I could potentially kill two birds with one stone - all the gaskets and seals removed to get to the timing chain could potentially solve the oil leak with new parts upon reassembly. There really wasn’t much more thought to put into it - I had to do it. I roped off a weekend and dived in. I was fully expecting this procedure to hurt the piggy bank. There are so many “while you’re in there” parts to replace when digging into the timing chain system. However, I was pleasantly surprised when I found that the parts to conduct the repair were readily available and inexpensive. An important note when overhauling the timing chain system on one of these Toyota four cylinders is to get the updated timing chain set, which includes one critical change: metal timing chain guides. Unlike the original-style plastic guides, these steel-backed units will last the life of the engine. Take a guess at how much that lot of parts set me back? Amazingly, only about $150—and that was with next day shipping! That’s simply unreal. They may not be original, Toyota-branded parts, but after thoroughly inspecting them, these OEM equivalent pieces are of high quality. This was an all-inclusive set that gave me the peace of mind I would have all the parts I needed to complete the repair. The first order of business was to set the engine to its top dead center orientation. This is where cylinder one (the cylinder nearest the radiator) is a the top of it’s compression stroke. I verified this by making sure crankshaft pulley and camshaft sprocket both aligned with their respective markers. Having the engine set to this position will almost guarantee that when you put the new parts in, the engine will be timed correctly. Before I started tearing into the front of the engine, I needed to analyze which parts of the engine would need to be removed to do a thorough repair. I determined I had to remove the oil pan, because if the plastic timing chain guides had indeed started to crack, it would mean chunks of plastic were now hanging out in the belly of the oil pan. Removing the pan sounds easy enough, but the truth is, this was the most difficult part of the whole operation. The front differential is directly below the oil pan and it needed to be lowered significantly before the oil pan could be extracted. Scraping my way past decades worth of grease and dirt, I found the bolts which held the differential to the truck’s frame. With a jack supporting the differential, I carefully removed the differential bolts. The darn thing still didn’t budge. I introduced some persuasion (hitting it with a rubber mallet) and the differential finally lowered. One obstacle down. Now came time to remove the oil pan. With the fifteen-or-so oil pan bolts removed, I freed oil pan’s seal against the engine block by tapping it with the rubber mallet. The silicone sealant released its grasp and the oil pan was free - almost. The oil pickup tube, the part that draws oil from the depths of the pan to feed the engine’s oil pump, was keeping the pan captive between the engine and the differential. The pickup tube was held in with four bolts which were easy enough to remove. However, I was not sure how I would manage to reassemble it and the oil pan when the time came. Oh well, I’d worry about that later. Finally, the filthy oil pan was free. Check out what was sitting in the bottom of it. Sometimes, it pays to be thorough. With the oil pan out of the way, it was time to start attacking stuff in the engine bay. Basically, everything mounted to the top, the sides, and the front of the engine has to be removed in order to access the timing chain system. It looks daunting with all the vacuum lines and hoses, but it really wasn’t too bad. In an attempt to make reassembly easier, I made sure to take a lot of pictures identifying how everything went together. Now it was time to remove the larger components like the valve cover, water pump, oil pump and timing cover. With those out of the way the timing chain system was fully exposed. Extracting the timing chain was simply a matter of removing the chain tensioner, unbolting the plastic chain guides, and pulling off the crankshaft and camshaft sprockets. Afterwards, I cleaned up the engine block surface so that it would be prepared for reassembly. With the timing chain components set on the work bench, it was time to do some old-versus-new part analysis. That little piece of plastic is the reason I had to do this repair. The old plastic chain guide had broken at one of the bolt mounting locations and was flapping around loosely inside of the timing cover. I caught it just in time! The new metal-backed guides should fare much better. It’s always a good feeling seeing new parts go into an engine. With the new timing system components in hand, I quickly fitted them up to the cleaned engine surface. I took great care in making sure that the timing chain and sprockets were in their correct orientation. If the discolored links of the chain don’t line up with the markers on the sprockets, then the camshaft and crankshaft won’t be in time with one another. With the new chain, guides, sprockets, and tensioner installed, the timing system was renewed. Now it was time to focus on making sure the engine wouldn’t leak. With new gaskets applied to the timing cover and Hylomar gasket dressing applied to all timing cover mating surfaces, I bolted the new timing cover into place. I then fitted up a new water pump and oil pump. Installing new gaskets and a new front main seal would surely mean the oil leak would be no more. With all components on the front of the engine sealed up, it was time to attend to the elephant in the room—the oil pan. The first order of business was to prepare the engine block’s sealing surface with brake cleaner and a rag. Next came the application of some Toyota-branded “Form-In-Place-Gasket” to the sealing ridge of the freshly degreased and repainted oil pan. With the clock ticking on the quickly-setting oil pan sealant, I began the delicate balancing act of installing the oil pan and oil pickup tube. With the space I had to work with, these two items had to be installed at basically the same time. Luckily, I didn’t drag my arm through the oil pan sealant while refitting the oil pickup tube. Patience, planning, and deliberate movements were the key to success here. With the oil pan installed, the difficult repairs were out of the way. But, I was still far from finished. Next up on the list was to refit the valve cover with a new valve cover gasket. With the valve cover gasket sealing surface cleaned and the half moon seals placed in their respective valleys, the valve cover was then set atop the cylinder head. Now commenced the lengthy process of refitting the engine accessories. Components like the power steering pump, alternator, and A/C compressor all have unique brackets that must be installed in a particular order. The pictures I took during disassembly were a huge help here. Reattaching the the vacuum lines and coolant hoses followed next. I then filled the engine with new oil and topped the coolant system off with fresh antifreeze. The job was finally complete! I must admit, this repair took more time than I had anticipated. The bulk of the work happened over a four-day span. But, you know what? The time spent was worth it the moment I turned the engine over. The four-cylinder sprang to life and settled into a smooth and quiet idle. Success! Gone was the rattling from the front of the engine and in its place was the feint tapping from the valvetrain. This is how the small turbo engine should have sounded all along. Chain wear marks on the old plastic chain guides. I immediately took the truck out on a test drive, eager to see if my repairs made a difference in the engine’s performance. Aside from it being audibly quieter and having a smoother idle, then engine still made good power as before. This just goes to show how well these Toyota’s run, even when the timing system is on its last legs. However, now I knew that the timing chain was healthy and there were no more unknowns. Bringing the truck home and parking it in the driveway, it was time to see if it was still gushing oil. Not a drop - I’m pleased to say that I haven’t seen even a hint of oil residue since! It looks like I was able to successfully repair two issues at once - making the time spent all the more worth it. Buying a vehicle that has covered more distance than it takes to get the moon could be considered a questionable decision by most. These sort of vehicles often need some loving. However, if you’re prepared to take on a few mechanical repairs, you might just be able to breath new life into that well-used classic.